When the iPad mini came out, some analysts thought it might cannibalize the sales of the existing iPad franchise with its comparatively low price, to which possibility Tim Cook answered ""We have learned over the years not to worry about cannibalization of our own product. It's much better for us to do that than for somebody else to do it." The first survey of consumer intentions regarding Apple's smaller iPad by Cowen shows that it might actually create more new market for Cupertino, rather than cannibalize iPad sales. The survey was done with a sample of 1,225 respondents,. 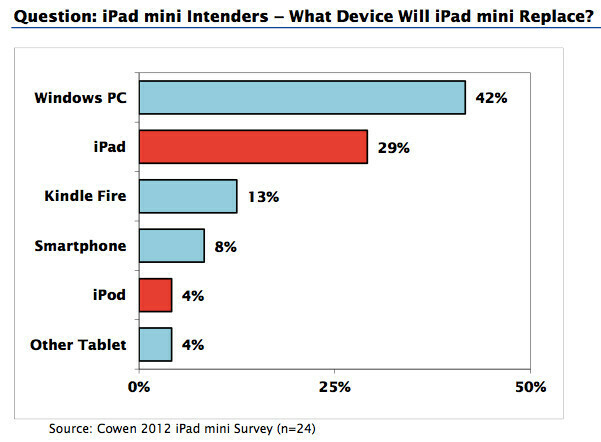 and half of the 12% who intended to get an iPad mini over the next 18 months said they'd never had a tablet before. In fact, only a third of those said they will replace an iPad with it, whereas 42% said they will get it instead of a Windows-based computer, and 13% instead of a Kindle Fire. 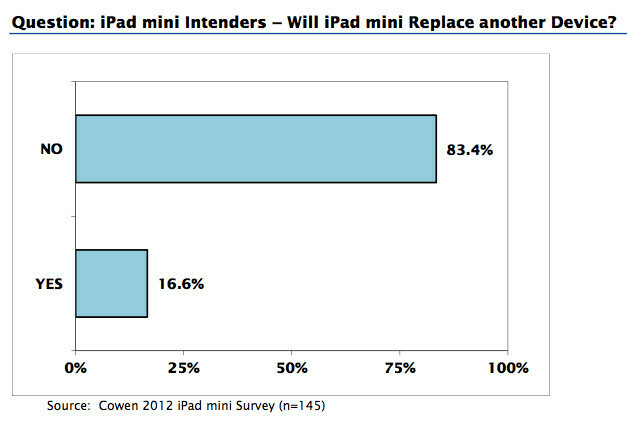 The iPad mini creates more demand than it cannibalizes. Since 52 percent of the mini intenders in our sample did not own a tablet of any type, we see it successfully positioned as likely to penetrate new entry-tier segments. … Mini will no doubt take some iPad “4″ sales, but its low price also looks like an important tool to capture new consumers’ attention. In other words, Apple seems to be achieving its goal to move into a niche market it didn't have presence before, of smaller tablets, for the sake mostly of computer purchases and Android slates, rather than existing iPads. Tim Cook reported record 3 million iPad 4 and mini sales in launch weekend, which, when compared to the new iPad launch, even if not evenly split, shows that Apple is largely creating a new market with the iPad mini for itself, rather than encroach on its other slates. Its not that the iPad mini is a bad tablet by any means, its just... Getting boring. Its just a refreshed smaller iPad, after all. just as the ipad, ipad mini. iphone 5 are so so boring...iphonearena articles are getting even more boring. after all its most of the time "i this" and "i that" and how wonderful that " i crap" is. Under Ray S's eyes, every product from Apple is perfect. Well said. PhoneArena does their best to cover every aspect of the mobile world. Not only those the majority of fanboys would like to hear about. Agreed. PhoneArena is balanced, they just post a lot of what is happening at that moment in time. I don't have a problem with that, it helps me make better purchase decisions when I have more information. balanced !!!! :)?....since when? havent you been reading all the damned biased articles about i stuff? Considering how much has been released by Apple recently, why yes, I have read a lot of "i" articles. I also read a lot of MS articles when the W8 tablets and phones were released. Yesterday I read a lot of HTC DNA articles, as well as Nexus 4 articles. If you can't see they post on all the OS' out there, take off you 'fan' glasses and look at things with neutral eyes. its you who have to remove the glasses & see..whatever glasses you are wearing..i glass or iphonearena glass... there are all kinds of useless, silly articles about "i" stuff : the 1st guy who got the i5..etc. is that really necessary? & do they give that kind of publicity to other brands? and i m sorry if you havent noticed how biased there reviews and comparisons are when it comes to the "i"s. plain & simply biased..! just 2 days back i read someone writing one of the lumias as an ugly phone! and anyone who read the htc 8x and i5 comparison article, would testify. you only have to read couple of sentences in that article to understand how biased the writer was. you dont appreciate the facts because you are the one who is wearing glasses..not me. ! Yet again, the survey size makes the results unusable. Not enough people, unknown demographics (for all we know this survey was held outside an apple store inside a mall), and unknown actual sample size. (I.e. 10,000 were interviewed, but only 1,225 were kept to make the results work and skew the actual facts). Not only that, there aren't many minis being sold, they have the highest return rate of an apple product right now (up there with the retina-display macbooks since they are having issues) and highest percentage return vs sold since the iphone4 fiasco. The iPad Mini is a recycled iPad 2 with a smaller screen with low PPI. There a better products out there that give you a more bang for the buck. Ok u said that a million times now. The thing is gonna sell to those whom it appeals to, obviously not u. So y do u keep saying that dude? because average consumers cone here for info, so pointing out a significant fact is relevant and useful? Apple is good at hardware and stuff, but they are greedy. They just want profit and almost every decision they make has something to do with that. Like the fact that iOS has no file manager, so people wouldn't install 3rd party apps or download music from the internet but go to the App Store and iTunes. Their software is ruining the experience a bit, and it's very monotone. Having an iPad and an iPad mini is a bit ridiculous, since it's literally just a smaller version with no extra features at all. But hey, I won't be childish and call everybody iSheeps. It's just my opinion. Well, they're making less profit per iPad Mini sold than per iPad, so if anything they've gotten less greedy. Well obviously, but the normal iPad sells for much more that the cost of its components as well (it's called making money), but with the iPad Mini Apple is taking a smaller percentage of profit than they are on the regular iPad. Show us the real sales stats for the Mini, not just a mix of the Mini and iPad4 so we can decide if Tim has it right or is just doing the Apple talk. Great. Yet another statistically invalid survey from a Wall St analyst. 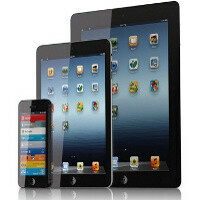 another lie by remix and other that stated that ipad mini will cannibalize sales of the ipad... I think it will appeal to people that could either not afford the ipad want an entry level ipad ..